Nigella seeds are a small and triangular exotic spice. The seeds are black and have a nutty sharp flavour that lingers and pungent aroma. 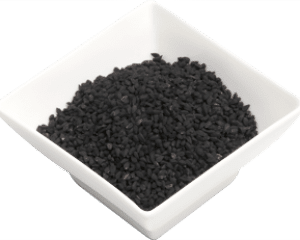 Even tough they can be incorrectly called black sesame seeds or black onion seeds, these are completely different. They are widely used in Middle Eastern and Indian cuisine. They are most commonly used in Turkish bread and are used in the Indian five seed blend Panch Phora. Use to flavour curries, dhal, rice, salad, chicken, chutneys, lamb and yogurt. Use to season legumes, beans and vegetables dishes.